The wrap that started it all. This beauty is one of my favorite designs of all time, and I haven't been able to calm my obsession with triangle scarves since the minute I got it off my needles. It's probably my popular collaboration with Lion Brand to date. 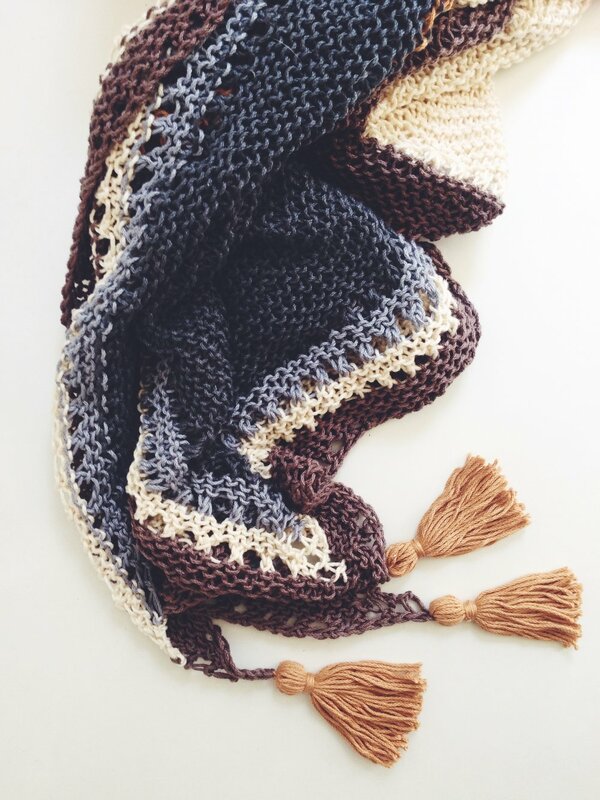 I am not at all a lover of a "shawl," but a wrap ... now that I can rock! I love the versatility of this piece and how it can bridge seasons since it's so lightweight and cozy at the same time. Whether you’re warming up to a hot cup of joe or popping in to cool off with an iced coffee, the Coffee Shop Wrap has you covered - literally. The cooling cotton won’t overheat you but the enveloping size and triangle shape is the perfect light layer for an air conditioned space. Wear it wrapped like a scarf in front or draped over your shoulders for two different looks. I could not be happier with the way the Lion Brand 24/7 Cotton yarn worked up in this piece and how it adds to the slinky drape of it. Keep scrolling for the free pattern, or purchase a printable, ad-free PDF here. This pattern is a joy to make. It is an easy level knitting pattern and the only techniques involved are knit, k2tog, and yarn over. The simplicity of the garter stitch is meditative and quick, and the occasional lace row and color change keeps things interesting. It's a perfect travel companion because the pattern is so repetitive that you can memorize it easily and take the project with you wherever you go! I chose uneven striping to give the wrap some originality, and once you've mastered the pattern repeat you can switch the stripe widths up as you please. The Coffee Shop Wrap works perfectly for stash busting because you can just end each color and start a new one at any point. Note: Wrap is worked from the top down, increasing 4 sts on every other row. The bound off edge forms the outer v-shaped sides and it is important to bind off loosely to prevent this edge from pulling and to allow it to drape nicely. 24/7 cotton is listed as a worsted weight yarn, but I find it to be lighter and more suitable to light worsted/dk weight, but any substitute yarn should be checked against the gauge. CO 7 sts with color A. Row 2 (RS): K all sts, including YOs, slipping markers. Row 4: K all sts, including YOs, slipping markers. Row 28: K all sts, including YOs, slipping markers. Row 30: K all sts, including YOs, slipping markers. Row 36: K all sts, including YOs, slipping markers. Row 38: K all sts, including YOs, slipping markers. Row 58: K all sts, including YOs, slipping markers. Row 60: K all sts, including YOs, slipping markers. Row 84: K all sts, including YOs, slipping markers. Row 86: K all sts, including YOs, slipping markers. Row 96: K all sts, including YOs, slipping markers. Row 98: K all sts, including YOs, slipping markers. Row 100: K all sts, including YOs, slipping markers. Row 101: K 1, YO, K to marker, YO, SM, K 1, SM, YO, K to last st, YO, K 1. (211 sts) Row 102: K all sts, including YOs, slipping markers. Row 122: K all sts, including YOs, slipping markers. Row 124: K all sts, including YOs, slipping markers. Row 128: K all sts, including YOs, slipping markers. Row 130: K all sts, including YOs, slipping markers. Rows 131 and 132: Rep rows 129 and 130. (271 sts). Row 134: K all sts, including YOs, slipping markers. Row 136: K all sts, including YOs, slipping markers. Bind off loosely. Secure and weave in all ends. Block work. To make tassels, cut ninety 12”/30.5cm lengths and six 18”/46cm lengths of color A. Divide the 12”/30.5cm lengths into 3 groups of 30. Tie each bundle at the middle point with one of the 18”/46cm lengths. Fold each bundle in half so that the tie is at the tip of the loop created with the fold. Tie crosswise around each folded bundle about 1⁄2”/1.25cm below top of fold with remaining 18”/46cm lengths. Wrap the tails of the ties around and around the bundles and then thread them inside and down the middle of the bundles with a large eye blunt needle. Tie the tops of the tassels onto the 3 corners of the wrap and knot to secure. Thread the tails inside and down the middle of the tassels using a large eye blunt needle. Trim tassels to desired length.